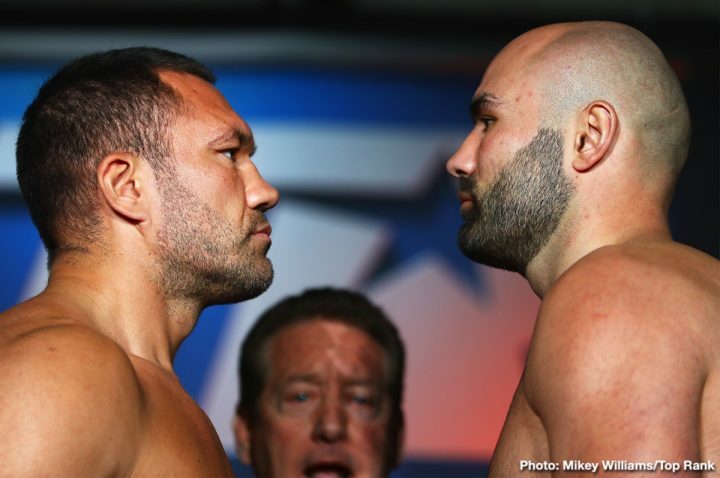 By Jim Dower: Former heavyweight world title challenger Kubrat Pulev (26-1, 13 KOs) will be fighting tonight against Bogdan Dinu (18-1, 14 KOs) in an important contest for the 37-year-old Bulgarian fighter on ESPN/ESPN Deportes at 10pm ET at The Hanger in Costa Mesta, California. The Pulev-Dinu fight is scheduled for 10 rounds. Top Rank Boxing recently signed the highly decorated former amateur star Pulev, 6’4 1/2″, and they have hopes of getting him a quick title shot against WBO heavyweight champion Anthony Joshua after they have him take one more fight in the fall. Until then, Pulev has a fight tonight against the 6’5″ Romanian Dinu, and then a match later on this year. Some boxing fans believe Top Rank only signed Pulev so that they can take advantage of him being the WBO mandatory to Joshua, but that’s not the case, according to Top Rank boss Bob Arum. They signed Pulev to have take part in some interesting fights, one of which obviously is a fight with Joshua. Another fight that Top Rank will likely have Pulev take part in a fight with Tyson Fury at some point, but AFTER both face Joshua. The choice of Dinu for Pulev is peculiar one. Dinu was knocked out in the fourth round in his last fight in November of last year by Jarrell Miller. It would have been a little more interesting if Top Rank had put Pulev in with someone with talent, but then again, they wouldn’t want to risk have him lose due to his WBO mandatory status. If Pulev were to lose, he would miss out on a title shot against Joshua, and that would be money that wouldn’t be coming into Top Rank as well, one can argue. As such, instead of Pulev fighting a live dog, he’s fighting someone coming off of a knockout loss to Miller last November. “That was not the reason we signed him — that [mandatory fight] was just a bonus,” Arum said to ESPN. “We’re going to help make that fight happen, but we signed him because we can show the public a decent foreign fighter in a competitive heavyweight match. How well it’s received depends on how he performs, but he’s not going to sit. We’ve talked to Ivaylo and John about it — maybe a summer or early fall fight after this one to get him ready for Joshua,” Arum said. Pulev will have problems when it comes to him fighting Joshua. Pulev lacks the punching power to keep the stronger heavyweights honest. Five years ago, Pulev challenged former IBF/WBA/WBO champion Wladimir Klitschko, and was knocked down three times and stopped in the fifth round. Pulev made the mistake of trying to slug with Wladimir right off the bat, and he paid for it by getting dropped repeatedly by left hooks. Pulev was a sucker for Wladimir’s left hook. He would come forward and get nailed by that shot repeatedly. Since that loss, Pulev has come back to defeat journeyman level guys like Dereck Chisora, George Arias, Maurice Harris, Kevin Johnson and Samuel Peter. Chisora is a former world title challenger, but he’s over-the-hill at this point. The same with Kevin Johnson. Peter is a former WBC heavyweight champion, but he was completely shot by the time Pulev fought him. Pulev weighed in at 249.8 pounds at the weigh-in last Friday for his fight tonight against Dinu, who weighed in at 239.6 lbs. This is about the normal weights for the two fighters. Although Pulev isn’t a big puncher, he’s a facing a guy that was just blown away in four rounds by Jarrell ‘Big Baby’ Miller last November. It was a total blowout. Pulev is going to have his way against Dinu, who isn’t a world class fighter. Pulev will likely stop Dinu by the sixth round by just by jabbing him. Former World Boxing Organization super bantamweight champion Jessie Magdaleono (25-1, 18 KOs) will be fighting for the first time in 11 months when he faces former WBA 122 lb champion Rico Ramos (30-5, 14 KOs) in a 10 round fight. Magdaleno, 27, was knocked out in the 11th round last year in April by Isaac Dogboe.